Soil Guard™ is a durable outdoor entrance mat intended to guard against soil with its high-low scraping design. Its low profile allows for easy door clearance as well as regular cart traffic, while a specially formulated rubber allows Soil Guard™ to withstand harsh weather environments and heavy foot traffic. Soil Guard™ excels in both indoor and outdoor high traffic entryways, and can be hosed off for easy cleaning. Available with a silicon carbide grit surface for additional traction. 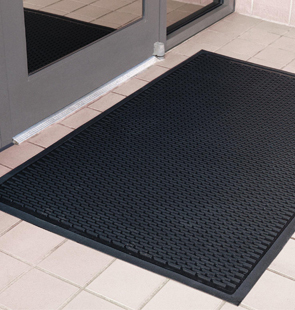 Heavy-Duty, durable rubber mat designed with low profiles for door clearance / cart traffic. Easy to clean — simply hose off. Overall thickness is 1/4" to minimize tripping hazard.